mollie's mom: A Quick Look Back - The ORC 2016 Is Just Around The Corner! 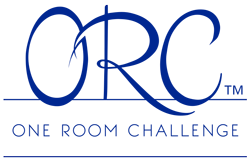 A Quick Look Back - The ORC 2016 Is Just Around The Corner! and I am jumping in again. It's a great way to "get 'er done"
But a bit of nostalgia and a tip or two before I move on to the latest room to be "ORC'D"
Yes, it's a verb now like "google" or "xerox." At least it is at my house. and a room filled with "stuff" a la Hoarders! it was much improved but not really "there." I also learned from some people's posts that they had thought ahead and sometimes pre-ordered supplies, painted rooms, or gotten more prepped than I had. moved electrical, plumbing and more. So ORC #1 has gotten a few tweaks. Another chair, a natural fiber rug, a change in lamps and it seems to be a little more finished feeling. The bamboo bar cart rolled in as a bedside table. for the ceiling light in the center of the room. The second ORC attempt was Mollie's bathroom and we had an absolute blast on our #motherdaughterorc. we had a great time pulling her bathroom from blah to Chinoiserie meets Boho Chic. We painted everything even the linoleum floor!! we are still loving that finished product. I highly recommend joining in. Or that's how I go about it! I do what I can with what I have - time, budget, creativity, patience. and some take the time to comment on your efforts which is fun and motivational as well. And I loooove checking in and seeing what everyone else is doing. It's one big productive design party! I think both rooms came out great! Love the bar cart and elephant! I'm giving it a shot this time. More worried about the technical/linking end than anything else. This is a great motivator for sure! Looks like you have it under control. I love the bamboo lighting fixture. Good luck and nice meeting you. Thank you Maria!! I am hoping the motivation will kick in soon for this ORC!! I did find some great fabrics, though!